TMT is short for “Thirty Meter Telescope.” The hotly contested controversial decision came in MAUNA KEA ANAINA HOU et. al., v. BOARD OF LAND AND NATURAL RESOURCES, STATE OF HAWAI`I et. al. 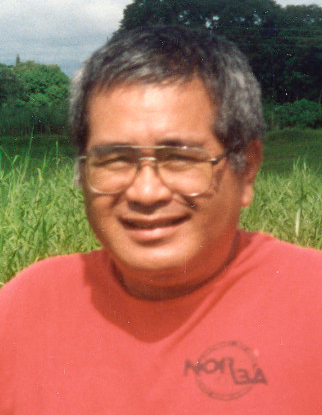 The lower court judge Greg Nakamura granted the alleged public deception and property theft to the Board of Land and Natural Resources (Board or BLNR). The Supreme Court overruled the neglected “due process.” The proceedings had been biased. The Supreme Court Judge C.J. RECKTENWALD ordered “fair open hearings.” Previously, the permit issuance depended on concealing from the public conflicting interests and military connections. The “eye” of this super-surveillance system, for example, was developed at taxpayers’ expense by the DoD/U.S. 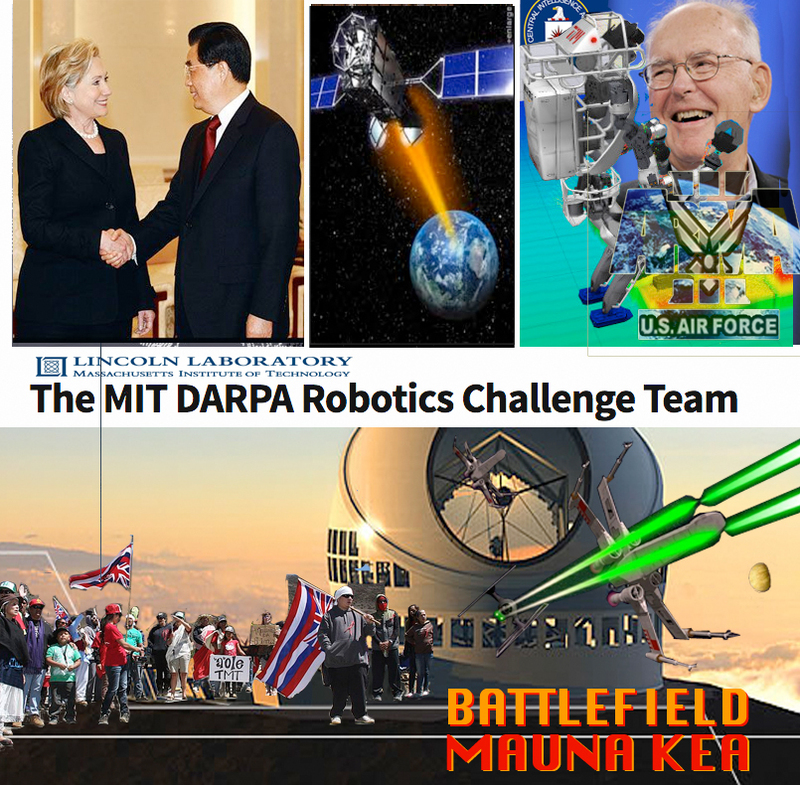 Air Force’s Lincoln Labs in Lexington, Massachusetts–MIT’s leading aerospace testing center. In the process of investigating these facts, these authors learned that the construction site is more than a “conservation district.” It is the sacred Mt. Mauna Kea–a Hawaiian Holyland central to ancient prophecies. Elders here have predicted for centuries civilization’s return to righteousness from this place high above the clouds. In the loving, healing, and peaceful spirit of ALOHA, this highest mountain on earth serves as the first place light touches. TMT critics claim it is hypocritical to build a telescope for “science” to explore the heavens when scientists can’t even figure out why the sacred Lake Wai’au adorning the mountain has been mysteriously vanishing. Meanwhile, one astonishing study of Big Island water neglected by the media suggests a politically-incorrect answer. Lava-heated steam from a property many miles away was captured by a famous Japanese water crystallographer, Dr. Masura Emoto. 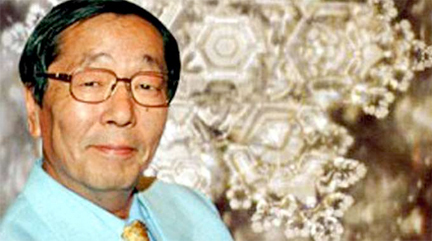 Dr. Emoto knew nothing about the ancient Hawaiian prophesies as the author of the New York Times bestselling book, Messages in Water. His experiment provided a clue for scientists, skeptics, and metaphysicists to ponder. This “double-blind” study simply sought to view flash-frozen water samples for crystallized messages. They may be found in the snowflake-like structures that scientists called “water clusters.” Magnified 20,000 times, the steam water sample corroborated what the Kahunas’ prophesied. Emoto’s series of photos published online presented clear and convincing evidence of Pele’s “message.” The entire set featured images that beautifully-depicted the micro-anatomy of a female reproductive tract, the creation of life by merging egg and sperm, and fetal development. The photo above is one in the set. It actually shows a human fetus-like ultra-sound image. You can see the umbilical cord attached to the naval. Mind you, this image is made from several million water molecules coming together to deliver this message. These words come from Dr. Leonard Horowitz, an award-winning author whose latest of six documentaries won the World International Film Festival CINEMA LOS ANGELES’ “Overall Grand Jury Award-2016,” and “Best Film – 2016” at London’s Cinemagic Film Festival. It vets previously secret military intelligence operations opposing, we kid you not, breast-feeding mothers who are viewed as “national security risks” for not getting their infants vaccinated. Dr. Horowitz is the Editor-in-chief of Medical Veritas International, Inc. a 501(c)(3) non-profit that sponsored Dr. Emoto’s research and published the results. The land is now being bulldozed, policed, and potentially prepared for military applications risking a ‘Space Pearl Harbor.‘ The courts and corporate-controlled media act oblivious to these facts and risks. Alternatively, they purposely neglect, censor, and mislead citizens. Everyone is simply told “there are no military connections what-so-ever,” and the “sheeple” believe it. The mainstream media’s bias, scientific and military censorship, is akin to ‘evidence tampering’ and ‘fraudulent concealments’ in law. These crimes are so palpable at the TMT legal proceedings it would be laughable were it not so deplorable. “According to legend, Pele is not blind nor apathetic to these corrupt proceedings,” adds Fox News defector, Sherri Kane. The ‘Fire Goddess’ administering volcanoes has siblings. Her ‘protectors’ steward the wind, rain, ocean waves and clouds according to wise elders. ‘Pele’s home is believed to be the fire pit called Halemaʻumaʻu crater, at the summit caldera of Kīlauea, one of the Earth’s most active volcanoes,'” Wikipedia reported(2) But Pele’s domain encompasses all volcanic activity, beyond the Big Island of Hawaiʻi. Pele is known for her power, passion, jealousy, and capriciousness. Curiously, in this showdown between “modern science” and timeless spirituality, there could not be anything more “capricious” than Lake Wai’au suddenly drying up near the telescope construction site after sparkling for millennia. Add to this Pele’s “message in water,” and the current TMT court case(s) being taxed by the parties vetted below, and this intelligence is special. Journalists nationwide have actually voted Hawaii as among the most legislatively corrupt states in the nation. This story affirms their vote. Here, famous legislators and lawyers promote the TMT. And when judicial officers in the Third Circuit Court ruled in opposition to “the Defenders,” local law enforcers “dutifully” denied their brothers and sisters’ spiritual rights, justice, and the metaphysical sustenance and sanctity of Mt. Mauna Kea. The Supreme Court of Hawaii voted more righteously than the Big Island’s Third Circuit Court that favored the University of Hawaii’s application for approval from the BLNR to construct the TMT–a political time-bomb. High profile proponents included BLNR attorney Stanley Roerhig, and Tribune Herald reporter Tom Callis. This article vets both for conflicting interests and alleged complicity in organized crime. 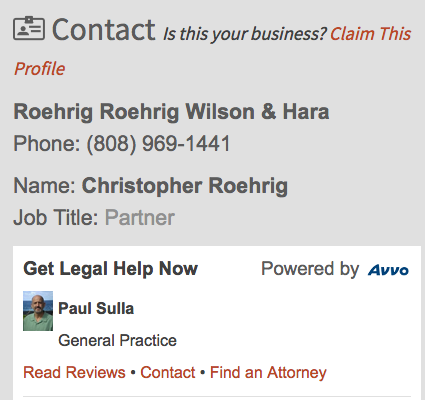 Roehrig is the owner of the law firm Roehrig, Roehrig, Wilson and Hara. In 2004, Roehrig’s partner, Glenn S. Hara, was appointed to the Third Circuit Court by the aforementioned Supreme Court Chief Justice Rechtenwald, who ruled in favor of the ongoing hearings. And Callis’s service in generating propaganda to mislead citizens by fraudulently concealing and diverting from military connections and conflicting interests is discussed below. “What I believe my research shows is that a TMT public relations publication which stated that TMT had no military connection was false,” said J.T. Kong, a legal and political scholar, and frequent contributor to these investigators. “Furthermore, based on my review of the public record, TMT knew that because of its existing contract with the Department of Defense (DoD) Lincoln Labs to manufacture TMT’s AO (optical) Wafers–the “eye” of the telescope–that this statement was false. “Additionally, because the previously proposed telescope Pan Starrs was rejected in no small part by Native Hawaiians because of its military connections, TMT’s statement that there was ‘no military connection’ was material. As reported by the Civil Beat, attorney Roehrig joined the majority in a 5-2 vote to approve new rules aimed at preventing TMT protestors from camping on the mountain and continuing to block construction of the $1.4 billion project. Later, when rumors about Roehrig’s conflicting interests began to circulate, Roehrig gave up his board membership in the TMT-funded nonprofit Keaukaha One Youth Development (“KOYD”) group. Although this group may be helping some youth, it best serves as a public relations ‘front’ for the TMT and its financiers. Retired Hawaii police investigator Benish. 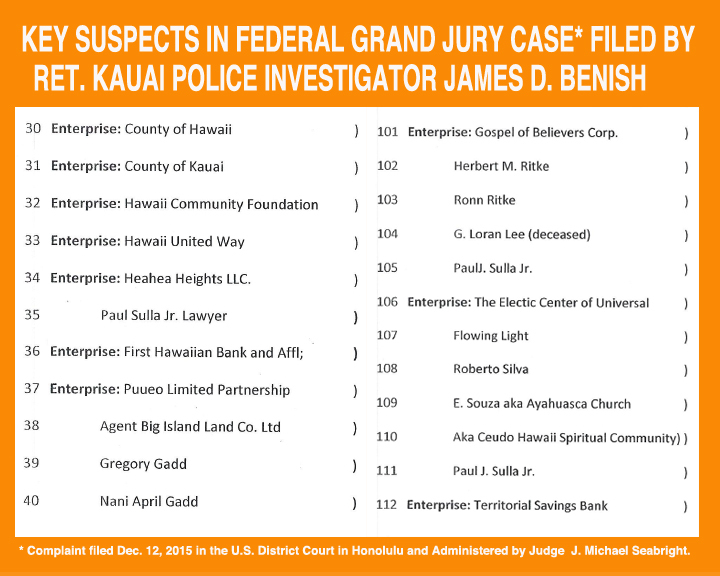 The Hawaii Community Foundation is an alleged money-laundering racket according to a federal grand jury complaint filed by retired Kauai police investigator James Benish in December, 2015. Two other state-wide corruption grand jury investigations are also underway in Hawaii at the time of this writing. One of them is being stonewalled by the Honolulu Chief of Police, according to federal prosecutor Michael Wheat and his team. They call this statewide corruption in “paradise” extensive. The same is true in Benish’s grand jury complaint involving lawyers, law enforcers, and judges in Kauai and on the Big Island. “Roehrig’s denial is unreasonable,” opined Kane, who was named as a journalist-witness in the grand jury complaint filed by Benish. Benish’s Grand-Jury-Complaint filed 12-11-15 revealed previously secret financial interests abusing “non-profits” statewide, akin to what is happening nationally with the presidential election focusing on the Clinton Foundation and “pay-to-play” abuses by the Clintons. 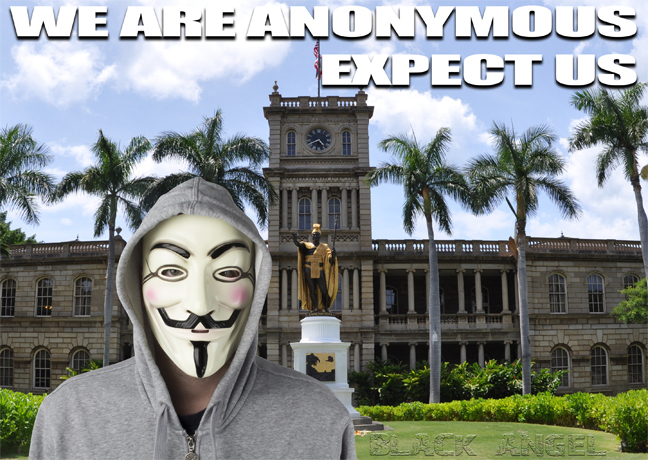 Kane reported that the activist group called Anonymous contacted her expressing solidarity in their interest in purging Hawaii of corrupt officials and pedophiles. Roehrig and Hara found to have diverted stocks. Anonymous sources revealed that attorney Stanley Roehrig has a history of concealing knowledge about his clients’ financial interests involving his law firm in shady deals and alleged theft schemes. Roehrig’s history of being accused of unjust enrichment with the help of the Third Circuit Court is evident in the case of George Miyashiro v. Roehrig, Roehrig, Wilson & Hara, ICA No. 28395, March 23, 2010. This public record tells much about Roehrig and his previous partner, now Third Circuit Judge, Glenn S. Hara. “Make sure we keep our hands on shares,” Roehrig directed Hara pursuant to George Miyashiro’s stock certificates. “Have Geo[rge] sign note to Escrow agreeing that we hold stock,” Roehrig added. The lawyers’ enrichment scheme bled client Miyashiro out of his wealth in that case, requiring the higher court to overturn the Third Circuit Court’s willful blindness to the Roehrig-Hara scam. This is one instance not withstanding the obvious conflicting interest Roehrig’s previous partner, Judge Hara, brings to the “impression of impropriety” in the Third Circuit Court. “In reviewing our phone conversation yesterday, I felt that your options mentioned were unfair and lacking in good faith,” wrote Miyashiro’s ex-wife Carol to Roehrig. Neither Carol or George, albeit in dispute, could imagine Roehrig and Hara’s alleged embezzlement. It took the appellate court to grant the Miyashiro’s the legal right to distribute their own stock, a constitutional right withheld by Roehrig and Hara. In that case, Associate Judge Katherine G. Leonard discovered that Roehrig worked George and Carol against each other. Roehrig divulged “confidential information to Carol without George’s consent,” wrote the higher court judge. 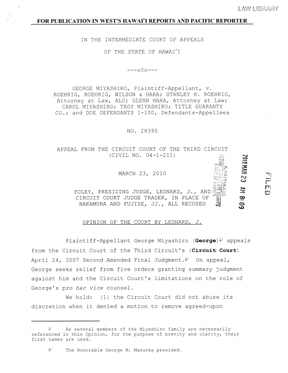 George was Roehrig’s client, but Roehrig “arguably provided legal advice to Carol that adversely affected George,” explained Judge Leonard for the Intermediate Court of Appeals. “Roehrig refused to deliver the stock certificates to George, notwithstanding George’s repeated demands. Roehrig’s memo to Hara stated, “make sure we keep our hands on [the] shares,” noted Leonard. Roehrig even caused George and Carol to believe that George could not vote on or direct the company’s shares if Roehrig held them. The Judge summarized the expert legal opinion of law professor Randall Roth–a nationally known trusts and estates expert–that Roehrig had violated a host of ethical rules. “Roehrig violated Rules 1.1, 1.2, 1.3, 1.4, possibly 1.6, 1.7, probably 1.8, 1.9, possibly 1.10, 1.13, 1.15(f)(4), possibly 1.16, 2.2, possibly 3.3, 4.1, 4.3, and 8.4 of the Hawaii Rules of Professional Conduct,” Judge Leonard reiterated in reversing the lower court that damaged George and Carol. Even so, Roehrig was never disbarred. Nor was he and Hara even disciplined. Roehrig’s current State Bar Association membership registration is blemish-free. Roehrig, in fact, is advertised as a regular member in good standing by the Office of Disciplinary Counsel, purportedly directed by the Supreme Court of Hawaii. In this vein, astonishing evidence of rampant judicial corruption in Hawaii is available with a few clicks of your mouse. 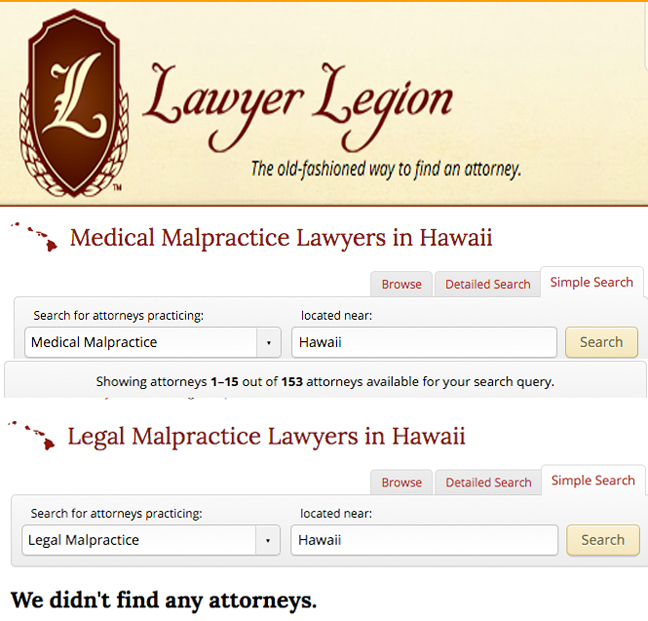 Searching for a “Legal Malpractice Lawyer in Hawaii” compared to a “Medical Malpractice Lawyer in Hawaii” is not possible through the Hawaii State Bar Association or any online State service. Similarly, a telephone inquiry to the Bar returned “two possible” lawyers who “might take your case” against a “brother” attorney. But more than 150 lawyers in Hawaii are readily available to sue a medical doctor or dentist at the drop of a hat. The outcome reveals a stunning disparity in professional service availability to protect the judicial industry exclusively. This is a racket AND protection racket. This matter of bias and corruption is, in fact, secured by the Supreme Court of Hawaii and its associated membership “club,” called the State Bar Association. The aforementioned are perceived as regularly persecuting good lawyers who dare to report fellow members’ corruption. At the same time, the judicial enterprise protects lawyers like Mr. Roehrig. Many critics decry this blatant institutionalized bias that experts call “judicial capture.” Others lament this “judicial corruption” as the primary cause of America’s economic, ethical and moral collapse. No matter how you see it, this is how the judicial system works to help banks and crooks steal citizens’ money and property. Federal investigators confirmed the gist of what former Hawaii Gov. Ben Cayetano alleged–Hawaii citizens were suffering from state-wide corruption and lacking fiscal oversight, with the Hawaii Carpenter’s Union at its heart. This mob was sued by Cayetano for mounting a smear campaign through the Union’s advertising agency–Pacific Resource Partnership (PRP Hawaii). PRP is the same propaganda force promoting the TMT construction. It is also the same agency promoting the Honolulu rail project. Tom Callis’s “yellow press” is largely influenced by this statewide crime syndicate. This is the same group that ousted widely respected Hawaii County Councilwoman, Margaret Wille–among the most active consumer and environmental protectors in Hawaii, and friend to TMT and GMO opponents. During the past two years, the PRP morphed into a major political action (i.e., bribery) organization called “Forward Progress.” The PAC–a campaign financing corporate protection racket–spent more than $20K attacking Councilwoman Wille, just as they had former Gov. Cayetano, with negative mail and radio campaigns, and many millions more to promote the TMT. “This evidence reflects gross bias and conflicting interests in the media, the business world, and the courts that turn blind eyes to this obvious special-interest protection racket at the heart of the TMT controversy, current court hearings, and damaged people,” commented Kane. As mentioned, ex-Governor Ben Cayetano filed a lawsuit against the Hawaii Carpenters Union and Pacific Resource Partnership (PRP) after PRP spent $3 million on attack ads to defeat Cayetano’s campaign for Honolulu mayor. That defamation case was settled in 2014. Cayetano also filed a federal lawsuit in May 2011 against the city and federal government over the city’s planned $5.2 billion elevated steel-on-steel-rail-project that has gone billions over budget, with numerous parties tied to the Carpenter’s Union and PRP that are suspected of embezzling fortunes. Accordingly, in this context of statewide corruption, it would be unreasonable and extremely naive to neglect Roehrig’s presumed ignorance of the TMT money pouring into his associated “non-profits” along with the corrupt media spinning stories for public consumption and confusion as though all are operating independent of one another. Add to this the courts’ willful blindness and negligence undermining law enforcement, honesty in government, and even national security at risk here. Keaukaha One Youth Development (KOYD), on which Roehrig sat as a board member, is a nonprofit on the Big Island that provides after-school services for underprivileged native Hawaiian youth. That sounds great for public relations, but the people and other non-profits linked through this extended state-wide enterprise are deceptive. 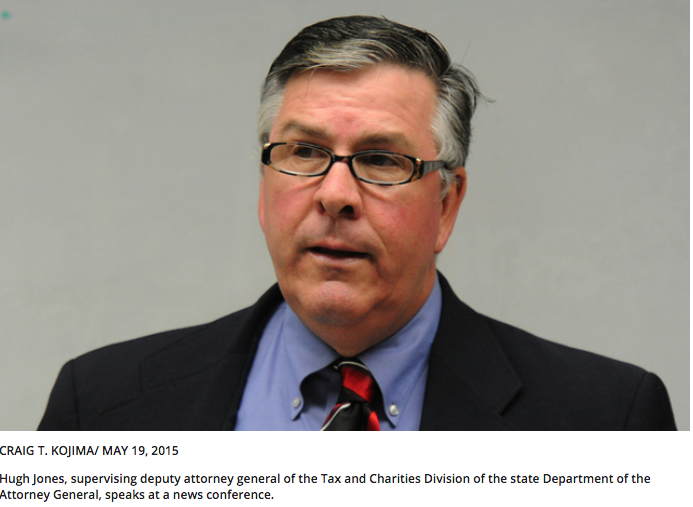 The director of the State’s non-profit activities is Hugh R. Jones. Arrested last month for drunk driving, Jones is married to another lawyer named Katharine P. Lloyd. A couple of years ago, Dr. Horowitz reached out to Jones for protection against Hilo lawyer Paul J. Sulla, Jr.’s administration of two “churches” evidenced to be involved in racketeering, real estate fraud, illegal drug manufacturing and distributing, lots of white collar organized crimes, property theft, and more. But Horowitz’s complaints fell on deaf ears. Jones referred Horowitz to the Supreme Court’s ODC, and the State’s RICO investigators at the Department of Commerce and Consumer Affairs, the “DCCA.” They too turned blind eyes to the shocking clear-and-convincing evidence the doctor provided. 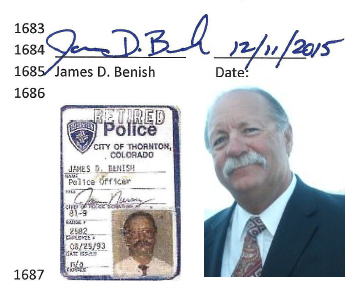 Now Jones, Sulla, and allied officials are key suspects in Benish’s grand jury complaint tied to a number of additional non-profit scams, schemes, money laundering operations, damaged citizens, and even murders. In Kauai, one scam worked this way. Hugh Jones’s wife, attorney Katherine Lloyd, worked as legal counsel for the First Hawaiian Bank, and so did her underling lawyer, Nancy Budd. First Hawaiian Bank has their own trust corporations, and when people deposit large amounts of money in this bank they are candidates for the formation of a trust to “protect” the money in ways that the Bank legally cannot, Benish explained. “Lloyd may refer the actual creation of a bank customer’s living trust to her colleague Nancy Budd, or Nancy Budd may have been retained as an adviser for the client and recommend the use of the First Hawaiian Bank. Budd will draw up the Trust, name an executor to control the trust, name another attorney colleague as the executor’s adviser (on the trust payroll), and recommend a charity to hold an interest in the trust,” Benish detailed. This is where the Hawaii Community Fund comes in. Lloyd worked for Hawaii Community Fund, like Roerhig worked for the Hawaii Community Foundation, both until a conflict of interest complaint was filed. Then they resigned. To make things worse for the public, their clients, and the integrity of the State Bar Association that largely influences all courts in Hawaii, Lloyd’s husband, Jones, as the chief investigator of non-profit corruption in the State, has covered-up a number of fellow lawyers’ criminal acts. Jones, busted for operating under the influence, also operates like a fox protecting the hen house from within the Hawaii Attorney General’s office. In charge of the Trust and Charities Department for the State’s top law enforcers, Jones purportedly works in concert with the racketeering and organized crime (RICO) departments of the State’s DCCA–supposedly protecting citizens against corrupt bankers, lawyers, and “non-profits.” Instead, through Jones, the entire racketeering enterprise regularly protects allied gangsters. In other words, when a conflict of interest charge comes into the Hawaii Attorney Generals’ office from citizens, like one of Lloyd’s victims, the complaint gets trashed courtesy of Lloyd’s husband. This is what Benish’s investigations revealed. Jones became willfully-blind when challenged. Jones denied he had anything to do with the business of his wife, Lloyd. Jones said she was innocent of any wrong doing. White-wash complete at the AG’s Office. There is a pattern here. The AG’s “fox”–Jones–did the same damage to Horowitz on the Big Island. The doctor reported attorney Sulla to Jones. Sulla committed a similar non-profit scam as had Lloyd. Sulla’s alleged white-collar crimes resulted in the theft of the doctor’s Steam Vent Inn & Health Retreat from whence Pele’s message came to Dr. Emoto. Sulla’s crimes also linked to Roehrig’s law firm and Judge Glenn S. Hara, whose superior, Chief Justice of the Third Circuit Court, Ronald Ibarra, has permitted Sulla to steal Horowitz’s property. The scam involved a “summary judgment” proceeding much like Kane described above. Attorney Hara contributed to the doctor’s damages when in 2004 the soon-to-be-appointed “justice” acted as Horowitz’s lawyer. Hara negligently drafted a closing document later altered and forged by presumably Sulla’s “client”–Cecil Loran Lee–a convicted drug trafficker and property seller operating at the hub of this vast Big Island drug and money laundering enterprise. People forget that not only is the Big Island the State’s chief marijuana supplier with illegal growers netting reportedly $3 billion annually from converted real estate deeded to sham “churches,” “trusts,” “non-profits,” and “charities,” but Pahoa is among the nation’s leading methamphetamine centers according to federal officials. 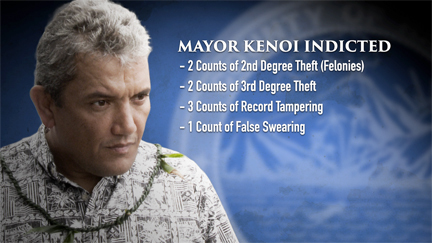 It is unreasonable to think law enforcers are simply stupid, or that indicted Mayor Billy Kenoi and his trusted County Counsel, Lincoln Ashida, knew nothing about any of this illegal drug trade. Hilo Investigation Into “Elder Abuse” and Suspected Murder Involving Attorney Paul J. Sulla, Jr.
“In these times of rampant loss of faith and trust in literally all branches of the US Government,” Codefore wrote after a grand jury was empaneled to investigate the aforementioned statewide corruption, Federal Judge J. Michael Seabright “took the high road. . . . He stood up knowing that there would be criticism from colleagues and others who have much to lose by his action, and he has given us hope,” Codefore published online. Investigator Benish further revealed that “the actual Stanley trust administrator got wind of the removal of the funds and petitioned a Hawaii court to seize the funds. This petition occurred too late to prevent the removal of some of the funds from the First Hawaiian Bank. . . . Paul Sulla Jr. challenged the relatives of deceased Stanley Zedalis in a Hawaii court by demanding custody of the body of Mr. Zedalis so that the body could be cremated in Hawaii. The Court refused the Sulla request and ordered custody of the body to the relatives . . . He was later buried without cremation in a National Cemetery in North Carolina with his deceased wife. Elder abuse is alleged, and Zedalis’s murder is suspected. Financial “elder abuse” that includes theft of retirees savings, and often involves conflicts of interests, the Angry Veteran wrote. These crimes often involve unethical self-dealing lawyers using churches and charities. 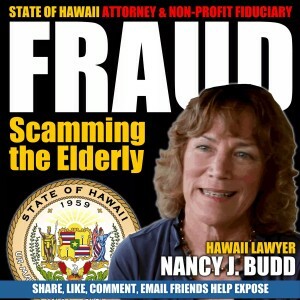 Undue influence, sham trust-building, and shady estate planning, is used to exploit elderly people–all white collar crimes neglected by Hawaii prosecutors, the Vet noted. Rarely do the con-artists get caught. The aforementioned Appellate Court case decided against Roehrig in 2010 was one such rarity. Roehrig initially prevailed when the lower court denied its victims’ justice. In the case of Jason Hester v. Leonard G. Horowitz et. al., Paul Sulla, Jr. has been Hester’s lawyer since 2009. Hester holds a criminal record for drug trafficking in Arizona, as did Sulla’s earlier “client”–the deceased property Seller, Cecil Loran Lee. That case actually began in 2004, shortly before Judge Hara was appointed to the bench. Roehrig’s firm took a referral from Island Title Company (now First American Title involved in a slew of lawsuit pursuant to statewide non-judicial foreclosure fraud) to sell Horowitz the Steam Vent Inn in Pahoa in favor of the local drug mob. 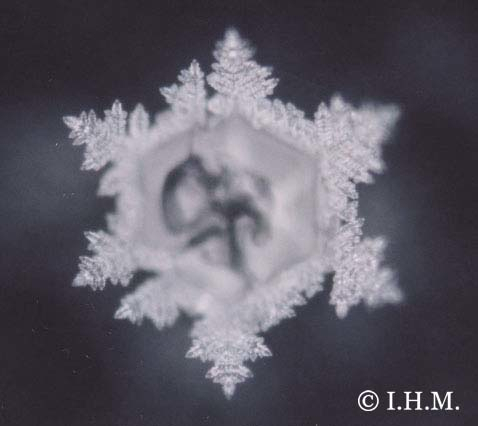 The property was Dr. Horowitz’s blessing turned curse–the sacred geothermal land from which Dr. Emoto obtained the aforementioned “message in water,” was used like a carrot-on-a-stick to sucker the doctor into an “unconscionable bargain” for malicious prosecution. It is widely known on the Big Island that Paul Sulla is the leading voice for “religious rights” to use marijuana. Before high profile marijuana minister, Rev. Roger Christie, got busted, it was Sulla who counseled him. After Christie’s arrest, it was Sulla who collected the money for his “friend’s” defense. 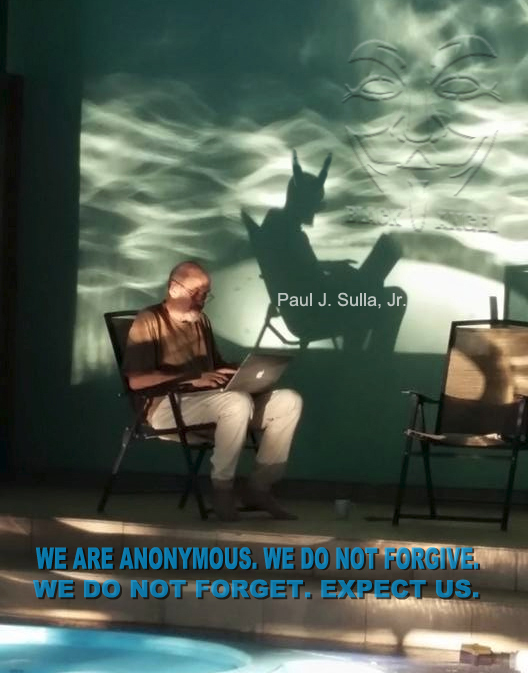 Moreover, Sulla is widely known for manufacturing and trafficking the illegal hallucinogenic drug “DMT” under the auspices of his and his son’s “Ayahuasca Church” in Honokaa. Law enforcers and local judges simply look the other way, even after Sulla pled his Fifth Amendment right to remain silent during sworn testimony before the Third Circuit Court in 2013. Twelve people were arrested during Christie’s bust, but not Sulla. Prosecutors described Christie’s ministry “as a front for a drug distribution ring.” But federal, state and local prosecutors looked the other way knowing Sulla’s ties to Christie, the lawyer’s Class I Narcotic “hoasca” manufacturing operation, and multiple cases where Sulla’s clients went to prison for following Sulla’s schemes to “wash” taxable income through sham religious trusts. (One classic example was ruled here, by U.S. Federal Judge Leslie E. Kobayashi in US v Ong, Hardy, et. al. in a Sulla Conspiracy Case Involving the Religious Trust Money Laundering Scheme Sulla Designed. Curiously, Sulla earlier client who fraudulent sold doctor Horowitz his property, was a predicate felon, forger, and drug dealer operating in the heart of Pahoa. He was one of Hawaii’s leading marijuana suppliers. His neighboring private air strip and property fell under a federal lien in 1999. This man–Cecil Loran Lee–concealed all the above when he twice sold the same property to two unwary buyers. Both times Lee used Island Title Co. to administering escrow, the money, and the titles. A lawsuit resulted when the first buyer, a Wells Fargo agent named Philip Maise, learned Lee concealed his criminal conviction and federal lien, and was going to prison. Island Title officials knew all about this, but concealed everything when they referred Horowitz–the second sucker–to Roehrig’s firm and Glenn Hara. These lawyers and their Island Title agents closed their eyes to the same scam damaging Horowitz. 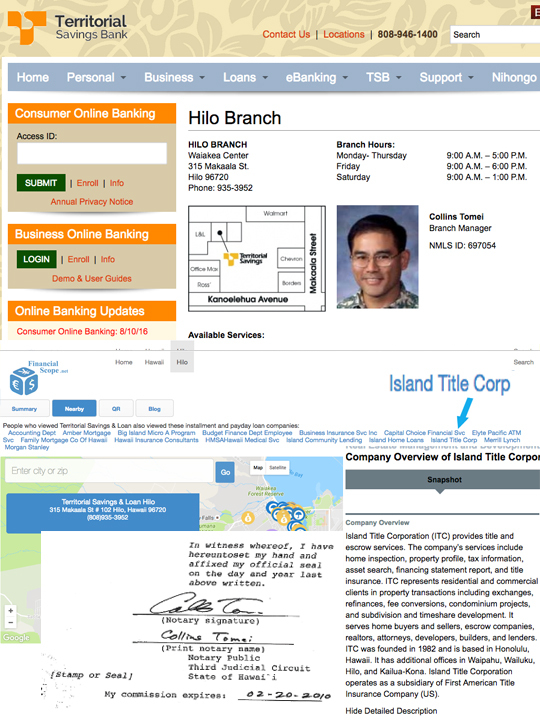 As Benish explained, banks are needed to “wash” illegal gains, and Island Title (an agent for Stewart Title Co.) has been involved with the local Territorial Savings Bank. There, the bank’s Branch Manager, is Mr. Collins Tomei. Mr. Tomei is also a Third Circuit Court notary. According to Philip Maise–a banking industry insider who worked for Wells Fargo to arrange loans at that time he was ripped off (2004), Horowitz was “set up” as the mob’s next victim. According to Maise, Tomei at Territorial Savings Bank allegedly laundered Lee’s drug money. 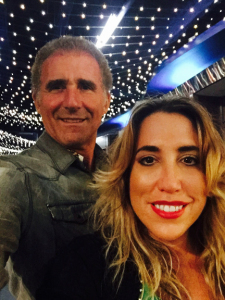 And according to Dr. Horowitz, Tomei is now implicated with Sulla in forgery, securities fraud, and grand theft of the doctor’s estate. 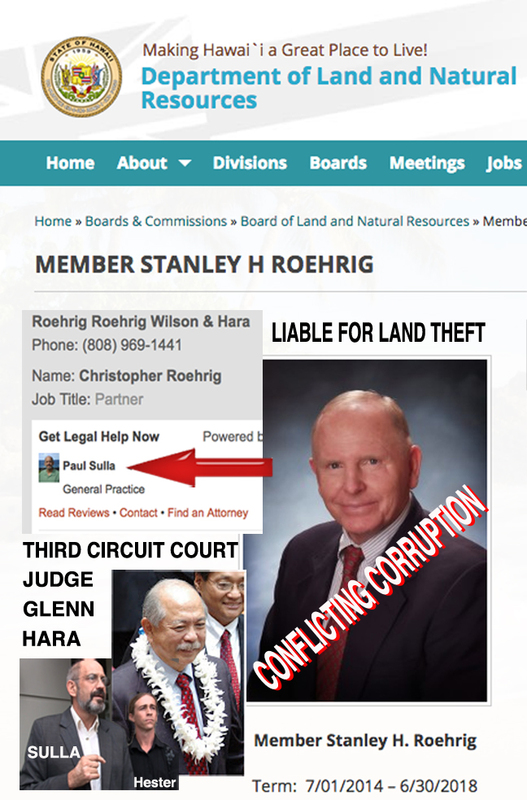 Rather than protecting the doctor who alerted local prosecutors to the widespread corruption in Hilo, Roehrig, and Judge Hara, aware of the massive amount of fraud and crime in their midst did nothing. Nor did local prosecutors Mitch Roth and Rick Damerville. Apparently, all the officials covered up for Judge Hara, Roehrig’s law firm, Island Title Co., and Tomei at Territorial Savings. The officials turned blind eyes to Hara’s negligently-drafted “Agreement for Closing Escrow” that should have been titled “Addendum to the Mortgage.” Even worse, officials willfully disregarded Lee’s alterations and forgery of that Hara-drafted Agreement. No one balked over Hara neglecting to keep a copy of the altered Agreement for his records. And worse, no one batted an eye to Hara breaching his contract with the doctor at trial by neglecting to testify, or even provide an affidavit. Why would he? It would only expose his malpractices and Roehrig’s shared liability. That set Horowitz up for eleven (11) years of litigation, and more than $6 million in damages, still growing at the time of this writing. By 2009, despite the doctor having paid off the entire $550,000 amount due on the mortgage, adding another $600,000 in property improvements, $150,000 more in fees and costs, while Lee was on his death bed in Arizona, the local drug mob wanted more money or Horowitz’s property. Suddenly, attorney Sulla appeared to take over for the dying seller Lee. An earlier graphic above shows an advertisement promoting the legal services of Sulla beneath Roehrig’s internet advertisement. Here is the larger screenshot. Sulla doesn’t advertise how anyone can steal someone’s house in a few easy steps. Here’s Sulla’s scheme in a nutshell: (1) Create a fake “church;” (2) Assign someone’s void mortgage and note into the “church;” (3) Claim the money is still owed on the note; (4) foreclose non-judicially; (5) transfer title into the new “church;” (6) sue the victim to quiet title in the name of the sham “church” while concealing your own conflicting interests; (7) rely on the corrupt court to see no evil by a fellow “brother,” and grant “summary judgment,” “quiet title,” and a “Writ of Ejectment.” Last but not least, (8) bribe a State sheriff to throw you off your property. This is precisely what Sulla did to the award-winning filmmaker and humanitarian scholar. This letter followed several requests for the Attorney General’s office to send a copy of their records for evidence against Sulla. When the record finally arrived, four-and-a-half months later, the main part of it was “REDACTED” (i.e. whited-out). In effect, the Official Notary Record was altered to conceal information likely to be a “smoking gun” proving forgery and first degree property theft alleged against Sulla. The REDACTED record compounds evidence of the AG’s complicity in the crimes. At the time of this writing, State attorneys were seeking a protective order which would permit BLNR member Stanley Roehrig, and his Chairwoman, Suzanne Case, to testify without filing required disclosures of their alleged conflicting interests. Opposition pleadings were filed by Mehana Kihoi in defense of the sacred Mauna Kea. (See: RECONSIDERATION TO DENY THE INTERVENTION OF PERPETUATING UNIQUE EDUCATIONAL OPPORTUNITIES AS A PARTY. PUEO’s Articles of Incorporation prove the real party in interest is Richard Ha, a Big Island entrepreneur who seeks to turn his once lucrative banana farm into a more profitable medical marijuana plantation. 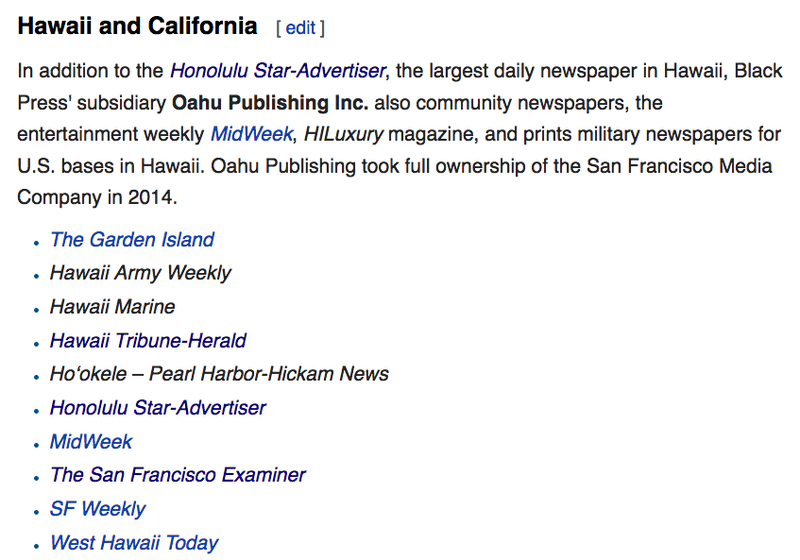 PUEO’s Articles clearly state: “No substantial part of the activities of the corporation shall be the carrying on of propaganda, or otherwise attempting to influence legislation.” But a quick read of Ha’s 600-acre Hamakua Springs website shows Ha has been issuing substantial propaganda, applauding TMT since 2009. Ha is far-and-away the business community’s leading propagandist pushing his view of “science,” not traditional Hawaiian culture. Although Ha’s heart appears to favor worthy youth education, his view of science is limited, and arguably dangerous. Native Hawaiians got along fine for centuries without robotics and the energy cartel that Ha applauds. Ha neglects to mention that the main reason why the biosphere has been largely destroyed is due to “life-saving science.” Ha doesn’t discuss the criminal concealment and monopolistic suppression of free energy technologies beginning with Nicola Tesla. So besides evidencing gross ideological hypocrisy operating within the pro-TMT community, purporting to represent “Native Hawaiians,” Ha’s links to Roehrig strongly evidence conflicting financial interests. 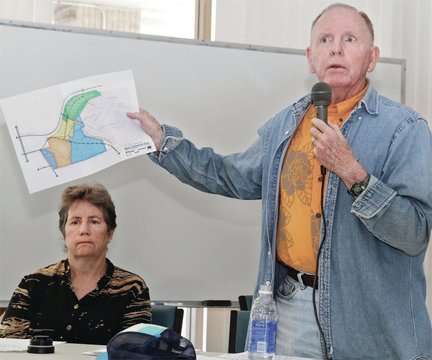 Ha’s front man, Warfield, has been leasing property from attorney Roehrig for use by the Keaukaha Youth One Development group, an offshoot of the Keaukaha Community Association also plugged by Ha. But the Mauna Kea protectors, exemplified by Mehana Kihoi, note that Warfield and his mentor Roehrig failed to disclose substantial financial incentives in their non-profit relationships; especially tax breaks Roehrig gains by securing property through lease arrangements with charities also sustaining Warfield. The public now sees the appearance of injustice in the TMT’s “due process” hearings. The lower court has concealed or turned blind eyes to important facts, such as the “military connections” to the controversial construction. The BLNR officials’ conflicting financial interests, now apparent, weigh heavy on the public’s trust. The “Emperor wears no clothes,” but the parade keeps marching. The public views shady lawyers: Stanley Roerhig, Hugh Jones, Glenn Hara, Paul Sulla, and the hypocritical business tycoon Richard Ha, as unscrupulous parties. Their “parade” features sham non-profits and shell corporations to front for land thievery regularly certified by the Third Circuit Court. The lawyers and financiers proclaim their aloha for “science” and “Keiki education,” while fraudulently concealing their conflicting interests. All the while, the courts are rigged against exposing such court officers’ malfeasance and judicial corruption. Even worse, what serious “scientific” evidence can we gain from the TMT’s view of any 3-foot tall object on earth or in the heavens, anytime, day or night, using the military “high ground” of space also determining nuclear supremacy via satellite telecommunications, surveillance, reconnaissance, and laser weaponry? In other words, what interests and intelligence might be gained for the TMT’s primary financier (besides China), the “Gordon and Betty Moore Foundation“–the “non-profit” “charity” established by Intel Corp‘s founder, Gordon Moore, who has five corporate partnerships established with the U.S. Central Intelligence Agency’s (CIA’s) In-Q-Tel company–a for-profit entity and wealthy private investment firm? These glaring questions remain for ultimately the Hawaii’s Supreme Court litigants to answer. (1) The SPACE PEARL HARBOR book and video was lovingly produced by these three award-winning whistleblowers with support from our faithful sponsors, CureShoppe.com and HealthyWorldStore.com. (2) Wikipedia is widely known as a CIA/MI6 Western Intelligence ‘front.’ It regularly conceals and spins information for public consumption and social engineering. 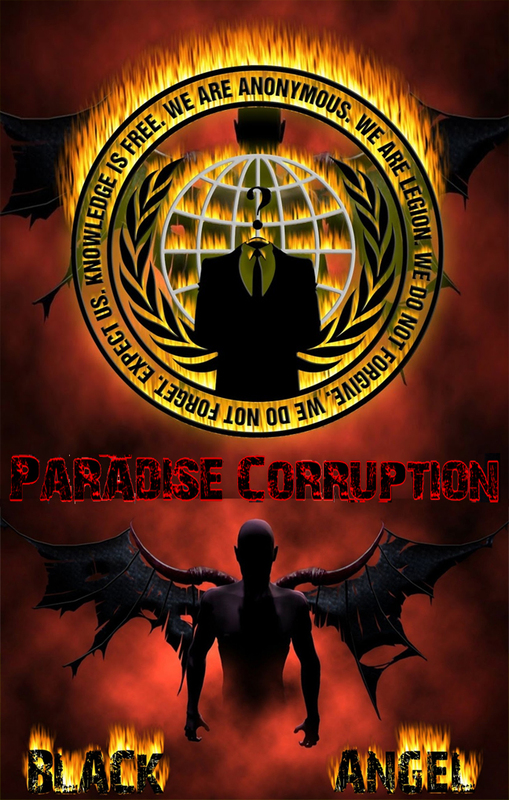 (3) Anonymous published the following Notice to State officials involved in corrupt activities. Dr. Leonard Horowitz, D.M.D., M.A., M.P.H., D.N.M. (hon. ), D.M.M. (hon. ), is an award-winning author of nineteen books and six documentary films. 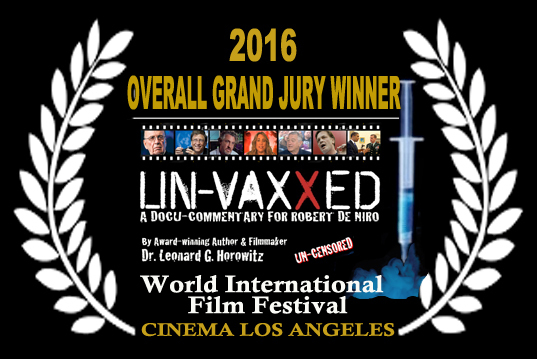 His latest film, UN-VAXXED: A Docu-commentary for Robert De Niro, was named the “Overall Grand Jury Winner” at the 2016 World International Film Festival at CINEMA LOS ANGELES. His nineteen books include 3 national best-sellers, including: Emerging Viruses: AIDS & Ebola–Nature, Accident or Intentional? that was largely responsible for prompting explosive interest in vaccination risks and biological warfare; Healing Codes for the Biological Apocalypse, that revealed the ancient Solfeggio musical scale secreted for millennia; and Healing Celebrations: Miraculous Recoveries Through Ancient Scripture, Natural Medicine and Modern Science in which Dr. Horowitz presents his protocol for administering prevention and natural speedy recoveries. His prophetically titled Death In The Air: Globalism,Terrorism and Toxic Warfare came out three months before 9-11-01. It deals with this topic of advanced energy weapons. His most recent text, The Book of 528: Prosperity Key of LOVE, has prompted a revolution in the music industry improving recording artistry and music therapy with the use of C=528Hz(A=444Hz) tuning that produces “medicinal music.” Dr. Horowitz is currently advancing Healthy World Organization (HWO) as an alternative to the duplicitous World Health Organization (WHO). Sherri Kane is an investigative journalist who defected from FOX News, Los Angeles, for ethical reasons. This psycho-social analyst is known as the “Lynne Russell of the Independent Media” for writing extensively as a political activist, counter-intelligence analyst, and media critic. She specializes in discovering and reporting on Internet “gang stalkers,” and the “PharmaMedia.” Sherri has trail-blazed links between the wealthiest Wall Street investors in mass media and the pharmaceutical industry. Sherri’s hobby is “culinary-alchemy” with herbal remedies. She also specializes in women’s, children’s, and animals’ rights, and is a leading avenger against human traffickers. Sherri’s strong advocacy for animals’ health and safety inspired her to launch the “Conscious Species Channel” on RevolutionTelevision.net. (An example of Sherri’s compassion resulting in miracles can be seen HERE.) Ms. Kane is the Vice President of Medical Veritas International, Inc., that launched with Dr. Horowitz the LOVE/528 Revolution, 528Records.com, and the 528Radio Network impacting recording artistry internationally; and the natural healing industry. Online DVDs featuring Dr. Horowitz and Ms. Kane include: NSA/CIA Trolls Destroy Heroes to Profit Villains: Snowden/Wikileaks Evidence Protection Racket for the Death Industry. “The HOROKANE’s” sponsors include CureShoppe.com, and HealthyWorldStore.com, and the public support derived from purchases therein, most of which finances their research, books, films, and educational events. J.T. Kong is a legal scholar, political investigator, and frequent contributor of research for “The Horokane’s” investigations. He has elected to forego having his bio published. To contact Sherri Kane, or Dr. Leonard G. Horowitz, please e-mail: editor@medicalveritas.org .